This is a documentary that had to be made! Twice Academy award nominee and five times AFI winner David Bradbury’s latest contribution, A Hard Rain, explores the ‘other side’ of the nuclear debate. Governments and most mainstream media are promoting that nuclear is now an attractive alternative to fossil fuels – the magic fix that will save us all from global warming. Nuclear power has taken on a clean and green spin from the low point 20 years ago which saw the Chernobyl meltdown. Traversing five countries – China, France, UK, Japan and Australia, and using what Bradbury learnt from his previous three nuclear documentaries (Public Enemy Number One, Jabiluka and Blowin’ in the Wind), A Hard Rain takes a closer look at the global nuclear industry in its entirety – from the mining of uranium through to the nuclear power plant to the radioactive waste and weapons manufacturing. It exposes the hidden agendas behind this latest push for Australia to go nuclear. Included are interviews with some of the world’s top scientists and environmentalists on the subject such as Dr Rosalie Bertell from Canada, Dr Chris Busby from the UK, and from Australia, Dr Mark Diesendorf (Ex CSIRO) from the Environmental Institute at the University of NSW, Prof. Ian Lowe, President of the Australian Conservation Foundation, and Dr Gavin Mudd from the Monash University Engineering Department. 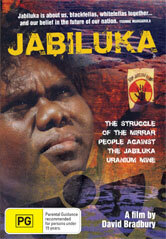 Interviews with traditional owners who have been locked out of genuine consultation with what is happening on their country is also included in this film. By looking at the experience of countries overseas that have gone nuclear, A Hard Rain debunks some of the myths of the nuclear industry: that nuclear is safe, cheap, health and green with little chance of another Chernobyl happening. If you want vital and factual information to debate the issue intelligently and overthrow the myths that the nuclear and pro uranium mining lobby has so successfully implanted in the media, in the government and the Labor Party, then this documentary is a must see.